Must enter at main gate, most class A's will need to go right and around the pass building and enter through a side gate. ---- FROM NORTH OF ALBANY: Take Interstate 75 South to Exit 99 (State-Highway 300 Cordele ,Georgia/Florida Parkway). Continue on 300 W to Albany (approximately 45 miles). Turn right onto Oglethorpe (Hwy 82 W) and then turn left onto Mock Road. Follow Mock Road to Short Street, then turn left onto Short Street. At the end of Short Street turn left onto Fleming Road. -- FROM SOUTH OF ALBANY: Take 75 N to 82 W (Tifton exit). Follow 82 W to Albany (approximately 45 miles). Take Business 82 W in Albany to Mock Road. Turn left onto S. Mock Road and proceed for 1/2 mile and turn right onto Fleming Road. Proceed on Fleming Road for 2 miles. ---- ADDITIONAL: From the intersection of I-75 & State Rt. 520/82. Go West on 520/82 (4 lanes) about 30 miles to S. County Line Road, turn south, take the first road right (west). Nice, remote campground in the forest. Easy to get to. Close to commissary and NEX. Pool was already closed for the season. Visited Radium Springs and the Welcome Center.Wanted to visit Thronateeska, but it's closed Sunday - Wednesday. Nice stay. Gnats, but no mosquitoes! Stop here each year on my way to Kings Bay, Big Rigs must go in side gate after opened by Base Security, Call the Chief helps. 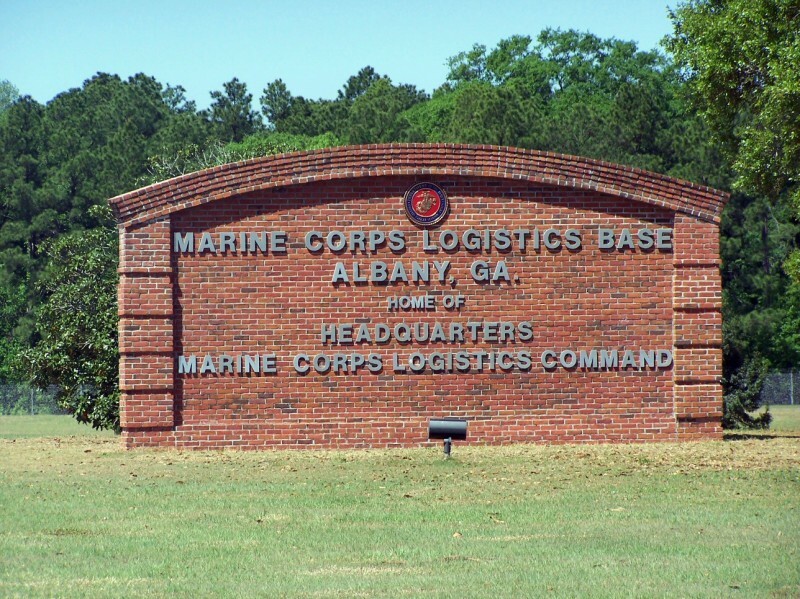 Base Directory is online, also there is a very large parking lot off base for stand alone units. Very clean. All short term sites are long and pull thru in center of campground. Gravel parking. Many homesteaders, the pictures show they even have storage sheds at their perimeter sites. The pictures are accurate, NO laundy at campground, base car wash did not work. Everyone on base was very friendly! Large units should contact the main gate to get help passing. They moved barricades after my call and before I left. There was even a guard there to direct traffic and get us out easily. Very easy to find this base and we were escorted to the campground. Had some concerns about entering through Fleming gate but with a 45' Class A and a tow vehicle it was no problem. The problem we did have was we asked for a site to be able to use our roof mounted satellite and were told no problem on site 4. There are so many trees everywhere so we moved to site 6 but had to stay far back in the site to find a clearing in the trees so could not use our sewer line as way too far away and site has an uphill grade. Most sites are used by folks working on the base and no host on site so when we called MCAS they could not find us in the system when we decided to leave a day early. Doubt we will be back here as it is not an area with much to do but for those of you needing a few nights stay it is fine. Good water pressure and strong electric and if you drive around the whole base you will see all the military vehicles, generators, and equipment they take in and repair and refurbish. Went through gate on Fleming Rd. was tight getting through barriers but took our time and had no problem. Gate guards were friendly, were changing over duty so the off going guards led us through the base to the CG. Upon arriving at CG was met by camp host, friendly guy who said just choose one of the open spots in the middle. All the center spots are pull thru and long enough to park at least a couple of RV's each. 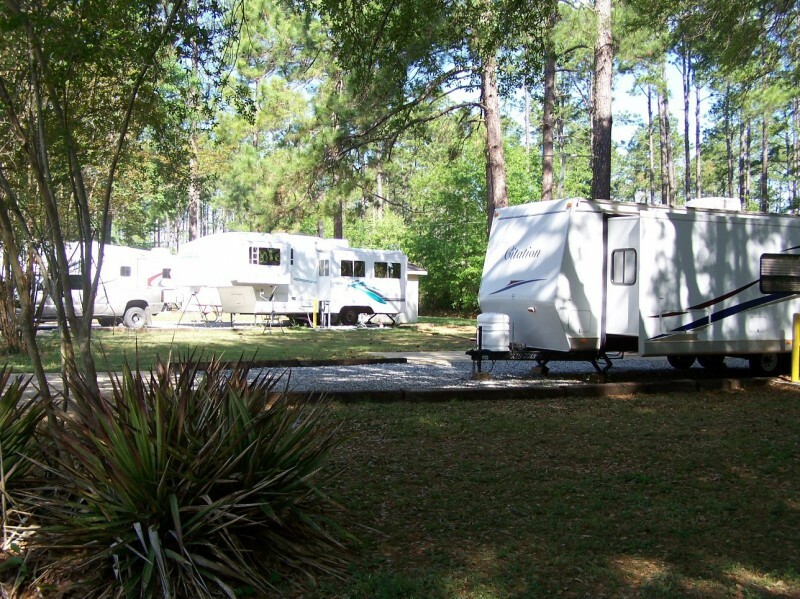 Inner ring is for short term campers and the outer ring, with the sheds you see in photos are for long term campers. Sites have 30/50 Amp service, WIFI, water and sewer at sites, there is CATV but you need a special box that you put down a $75 deposit on to be able to use the service, unfeasible for a short term camper. We didn't hook up water due to freezing temps, so not sure of pressure or taste. The bathroom/bath house is a good 150 yards from the CG but is modern, clean and nice & warm, building also has a good size laundry. Check in is located in building 3600 way on the other side of the base and disconnected from anything else related to recreation. It is directly across from the headquarters building, not the easiest thing in the world to find since there are no base maps in any of the literature available to campers. Base has a commisary and exchange, commisary closed on Sunday and Monday so didn't get to check it out. Thank goodness Wal-Mart is just 7 miles away. Overall this is a good CG with decent facilities, Set up more for long term use than short term the way it appears. I would recommend stopping here if you are in the area, I would camp here again. The commercial gate was not open when we came. At the main gate we drove around the pass bldg to get to the gate for easy access. It's locked. My husband, the driver, had scoped out the route at the gate & felt there would be no issue getting in. And it was fine. Our best friends, traveling with us are in a truck with a 5th wheel. They also came thru the main gate. Slow & steady. The gate guard gave us directions which we followed. And there are not many signs on the base. Take your time as you're driving as the trees are low. We had plenty of spanish moss on board by the time we got to the park. This is a small park with some long terms. Everything is neat & tidy. There are no fire rings. Never saw the bath house. The commissary & exchange are nearby. Gas pumps are in front of the exchange. It was easy to get our Class A to the fuel. There really isn't much on this base for activities. There is a bar/grill that is open M-F. We went in on Friday night thinking we would eat & then bowl as there is a 6 lane bowling alley. The grill was out of a lot of food as it was Friday nite & they would be closed for 2 days. And we couldn't bowl. You have to have reservations & the party a minimum of 6. We were thankful to see that several families had made arrangements to come in to bowl & that it was being used. The negative that we experienced was one evening when we came back to the RV there was a note taped to the door. Taped on all 4 sides. It was a notice reminding us of the hard freeze. That was not an easy task getting the tape off the door. My husband did call & have a conversation with the office suggesting that in the future notes be stapled to the handrail located by most RV doors. Downtown Albany has a great visitors center. Plenty of info & helpful attendants. Nice park. Ray Charles Memorial is unique. The statue is of Ray at the piano. His music is playing. The area around looks like piano keys and music notes scattered about. A few blocks away is a restaurant called Our Daily Bread. They even make their hamburger buns. (Except for the ones on the krispy kreme burger) One in our group had a Jimmy Carter burger. It had peanut butter on it. While you're downtown, find The Cookie Shoppe. They also serve b-fast & lunch. But, it's the cookies & baklava you want. Take time to look at the framed newspapers. They are original. Plains, GA - home of Jimmy Carter is a quick drive from Albany. Start out at the city's visitor center then head to the National Park sites. The visitor center is staffed by locals who really start out your visit. Make sure you drive out to Archery where Carter's boyhood home is. I don't know if we'll be back to this RV park. It was fine for what we wanted to do but it's not a destination park. W.O. left this review using the Directory software: - What a well kept secret! Inside circle sites are well over 100', pull-thru and level. Campground is clean. Bathhouse is a bit of a walk but very nice. Concrete patios. Internet is great. Our cable wasn't ready yet but TV reception is very good. One complaint: Our picnic table was dirty!! Oh, snap.....Would definitely return. 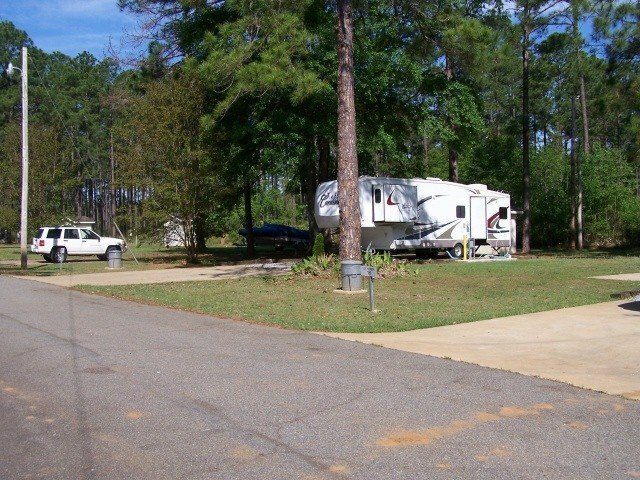 Visited on 5/20/2013, got a run around by security about using the side gate with my motor home, finally let me in after some discussion as to why I could not use the truck gate or the main gate. they did not understand backing up with a tow is not possible, and that there was a side gate besides the main that I could get through, there is in the out bound lane which I would not want to enter. On return 5/29/2013 I stopped in the large parking lot beside the pass & ID building and call the traffic control officer who came and let me in without any problem or static. Why have a truck gate that will not allow large RV's ? Most all other Military Bases Do! I would concur with the review in May 2012 on the poor directions. I could not find Mock road. My GPS took me to a closed gate along the perimeter fence on Flemming road. After a couple of miles West bound on the road; I had no problem entering the main gate in my 38foot class A with toad (albeit a narrow passage). After a round the block turn-around near the MCX, I found the campground. However, there needs to be additional signage on the the base. The campground itself is clearly a hidden gem. Most of the parked RVs were occupied (not stored). Very quiet. Fairly spacious pull-thru sites with full hookups for only $15. Good WIFI signal and very clean laundry and shower facility. I did not use the cable service. I would definitely stay again. D.S. 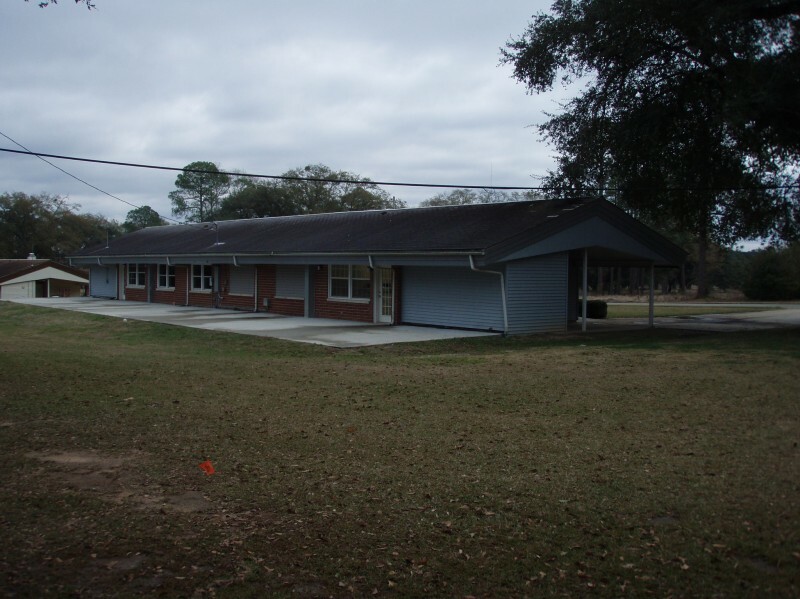 left this review using the Directory software: - Mostly homesteaders, some bushes need cutting, sell the pine trees and use the funds to plant good trees and improvements. 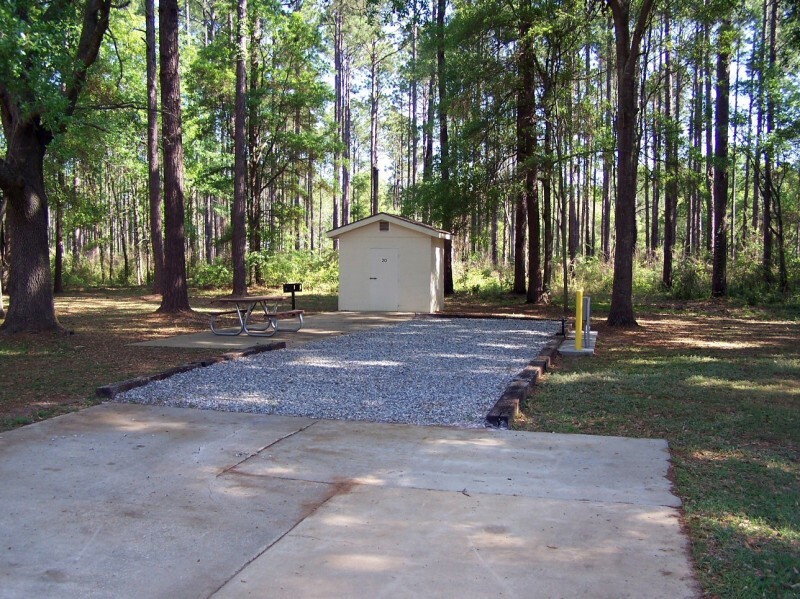 This park is a well kept secret, space 1 and some others are a tight turn for large motor homes to enter. D.S. left this review using the Directory software: - MWR needs to get the gate entry problem solved ! I am so surprised that no one seems to have had trouble finding the gate. The main gate has a "no trucks" sign, and the next gate down on Fleming, the Commercial Truck gate, says no POV. There is no gate simply named "truck gate". We came in from South County line and drove the whole length of Fleming looking for a truck gate. Got to Mock and realized it must have been back there somewhere. We called and were told we have to use the main gate. We have a 40' pusher with toad, but okay, we tried it. They allowed us to go around the building and out another fenced area - but why then do the directions here say truck gate? What a fiasco. Once we got here to the park, it's nice enough, and we may be back sometime now that we know where it is, but boy, the signage on base as well as these directions could use an overhaul! I'll revisit this when we leave to change the ratings as needed. ~~~~~~~~~~ November 29, 2015: As of October 2015 the commercial gate off Fleming Road is closed for reconfiguration and will likely not be reopened for commercial purposes, only POVs. The new Commercial Gate is off S Mock Rd, but is only for Commercial Vehicles; not RVs. 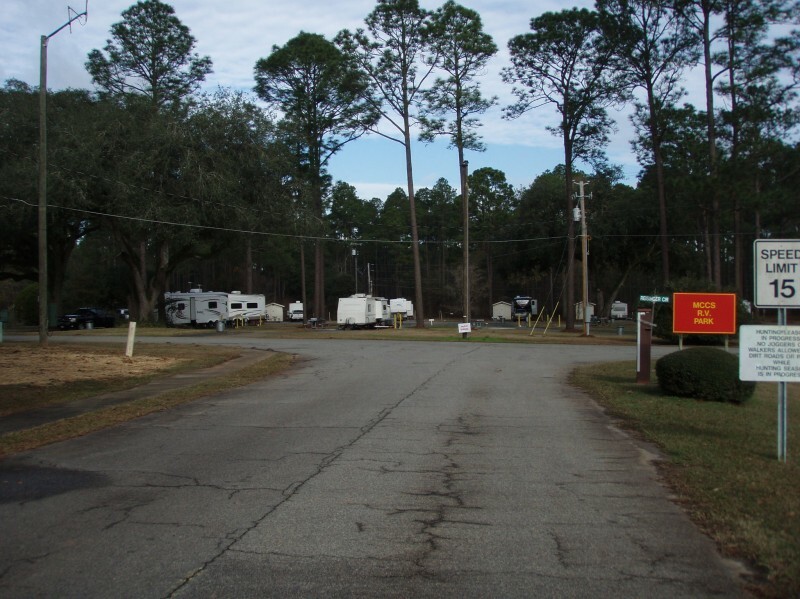 RVs must enter at main gate off Fleming Road. The "no trucks" sign in front of the main gate means no commercial vehicles, but the gate guards will open a gate for an oversized non-commercial vehicle. 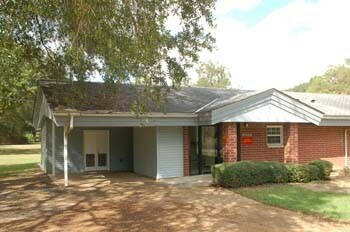 The office is in Building 3600 which is right behind the HQ building #3500 which is straight ahead on entering the base. This go-around the experience was much more pleasant, given that we called ahead to verify the main gate was the place to go. Sure wish we could have gotten our hands on an installation map, though. never did find the commissary. The base is about 45 min off I-75. This is our second visit to this FamCamp. We enjoyed the last stay and we are enjoying this one. Made reservations the day before, we were told that the spots with cable were saved for guests staying more then 30 days. On arrival we asked if we could get a slot with cable, again we were told only if we were staying 30 days. When we got to the FamCamp the host came to check on us. He remembered us from the last trip and told us he had no problem with us taking one of the empty slots with cable. We moved to one slot, someone put an odd type connector on the cable and we couldn't get it off so we moved to another slot. There are 20 slots, 8 drive thru without cable 12 back in. All have E/W/S plus a storage shed on the outer 12. 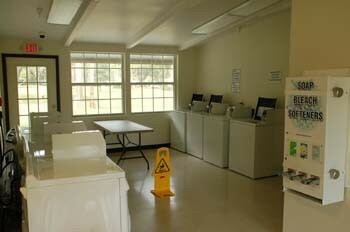 They are in the process of turning an old quarters into a bath house and laundry. It is well on it's way but host wasn't sure of completion date. We are just passing thru but asked the camp host what there is to do in the local area. 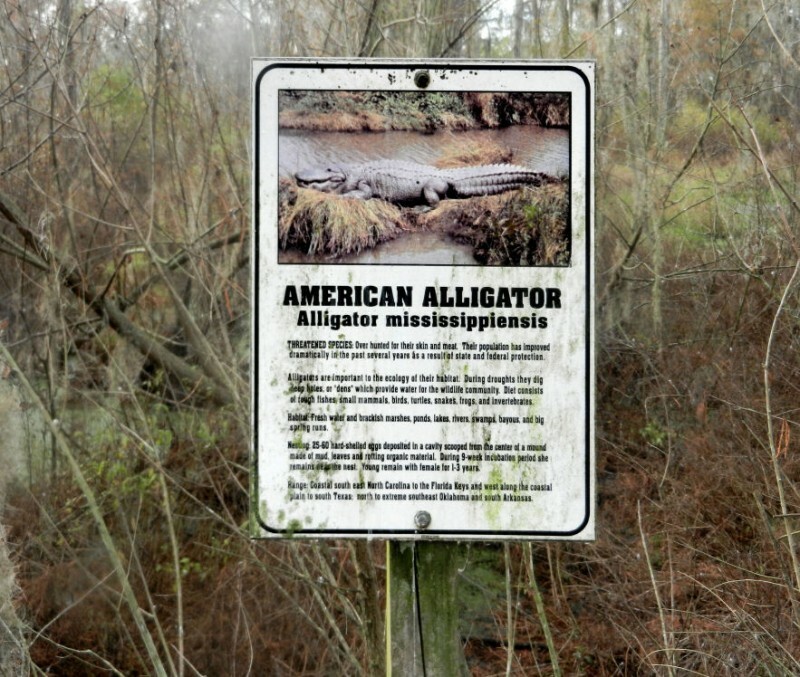 There is a lot of history in the area and he had a long list of things to see. Base has theater, gym, bowling ally golf course and the other things most bases have. Only complaint, the nats and there isn't much they can do about that. Am presently camped here. Very quiet, 10 sites occupied, including me. 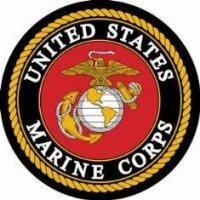 Most are active duty. Eight very long pull through sites and about another dozen or so in a large semi circle. W/E/S to all. The pull through are all relatively new additions. Walking distance to the Commissary/MC Ex...about 3/4 of a mile. Plenty of walking/biking areas. Outstanding WiFi, probably the best I have used anywhere. Attendant, Richard, a retired Marine that now runs the Housing Office, is a very pleasant fellow and knowledgeable of the local area. A laundry/bath facility is in the construction process nearby. 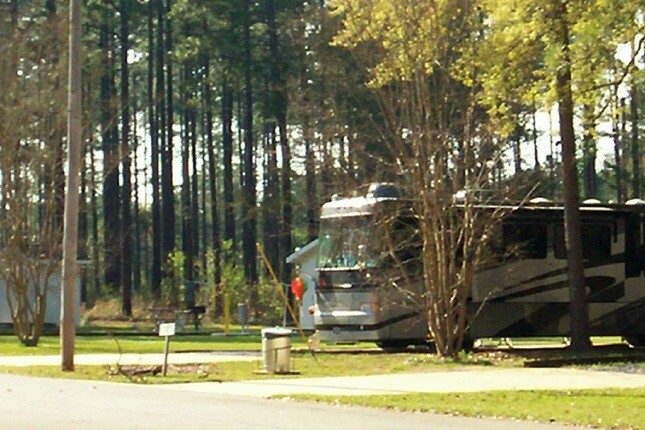 There are two RV service business in the nearby area only a few miles from the Base. 30 day maximum stay. I would definitely return here. Arrived at MCLB Friday afternoon from Florida. I have a Class B so we used the main gate. I had put the lat & long into my GPS but it didn't work that well when we got close. There were good signs though. I'm sure it is my GPS, it's older and I've had other problems with it. At the gate the guard gave good instructions. Stay right, go past the golf course, when you get to the fire station on your left, stay left and you'll dead end into the RV park. He was right. We had reservations, we were told we could pay the Camp Host or drop a check in the box. 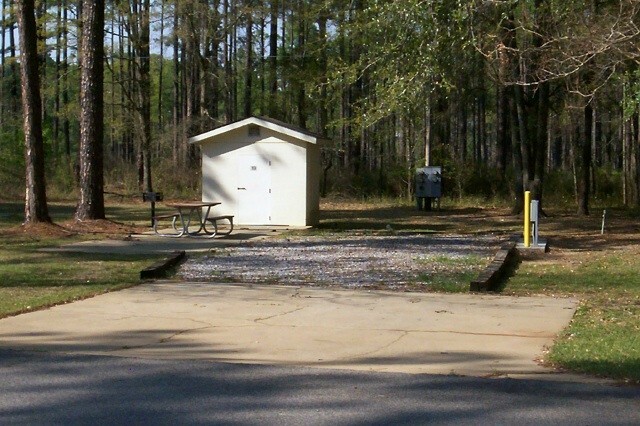 Camp Host works on base and he was at work, there were no envelopes at the drop box so we drove to the MWR and paid. Gas on base was much cheaper then the outside so we filled up. We noted the base theater had a good movie, first run, so we came back for the movie. ($2.50 adults $1 kids under 12) When we made reservations we were given an inside spot that had no cable. When we checked in they moved us to a spot with cable and they told us they had been trying to get them to put the cable in the middle spots but the guy hasn't done it yet. Also talked to the Camp Host when he came by and he said that they had new base housing so they kept an old house that will be converted into the bath house/laundry. He talked as it would be done soon. Wi Fi was great. All in all this is a hidden gem. Yes there are homesteaders but the area is neat and clean and for now there were plenty of spots. D.S. 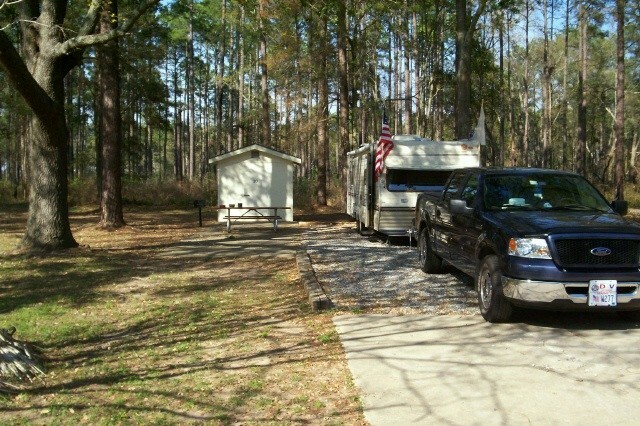 left this review using the Directory software: - Very nice RV park and base, MCX on Radford Blvd. Eight (8) new pull thrus are near completion, Super free WIFI, Super nice Camp Host. We made a reservation for one night and ended up staying three. This campground offers excellent value. Our only complaint is that it is deep within the base and you have to drive about four to five miles off the highway to get to the RV park. The directions do not indicate just how great a distance it is. The sites have mainly homesteaders but we were warmly welcomed. No campground office on site but the campground manager on site 10 was able to check us in. Sites now have excellent free wifi and cable. 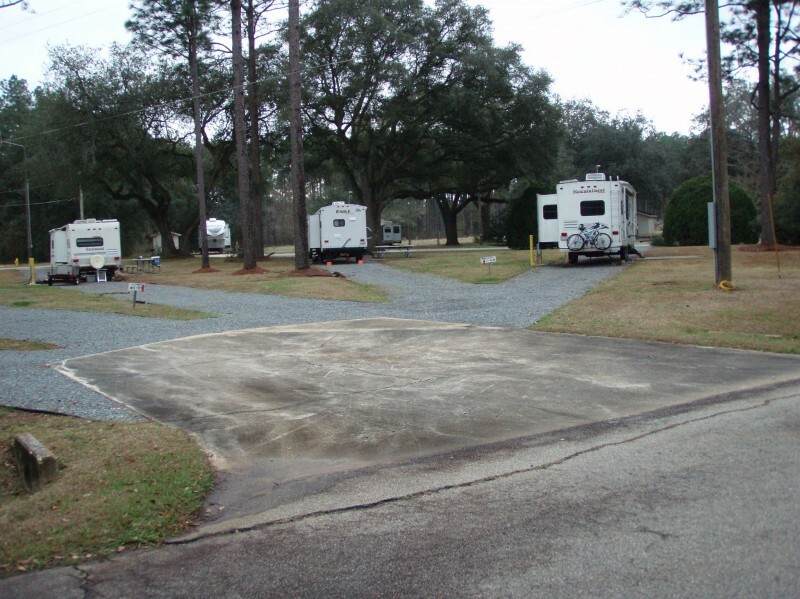 Wide paved sites with large area to accommodate tow vehicles. Not far from the base exchange and commissary. Rural type atmosphere, wooded area. Hiking in the woods not available at the time because of hunting season. We would definitely stay here again. We went down for the Snickers Marathon in Albany. We called a week ahead and had no problem getting a reservation. Arrived a bit late on Friday night and had a little problem with the directions given by the gate guard. Finally made it to our site and were pleasantly surprised to find there was cable in addition to W/E/S. All of the hookups were new and well maintained. There were 4 others homesteading in the park but other than that we were the only transients for the weekend. We found a nice hiking trail behind our site (#16). Everything was very nice and quiet. 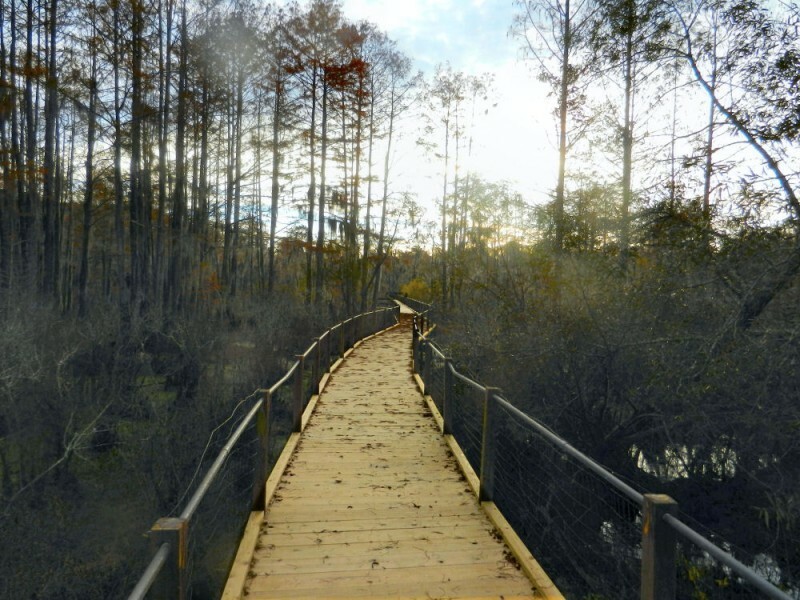 If you are looking for a place out of the way to get some peace and quiet, this would be it. The commissary, MCX, and gas station are about a mile away. We did find out from one of the homesteaders that the concrete out building was a storage shed from the days when Marine Corps bases had mobile home parks. 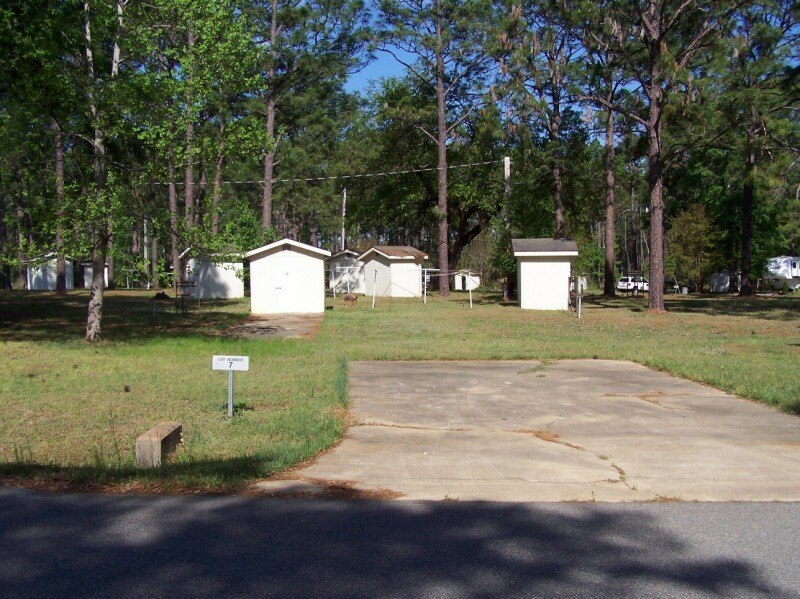 When the Marine Corps quit paying for folks to move their mobile homes during PCS's they turned it into a Fam Camp. I believe there was one at Edwards AFB as well. We called for reservations 1 night out; no problems. The lady was courteous and friendly. We arrived after 1630 (office closed) so we dropped a check in the box at the campground rather than try to find the MCCS office. $15 daily, $300 per mo. There's no camp host or office on site. 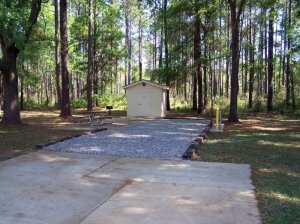 Each site was paved, level and clean. Picnic table and cute little 8ft sq. concrete out bldg on each site. (tornado shelter maybe??) 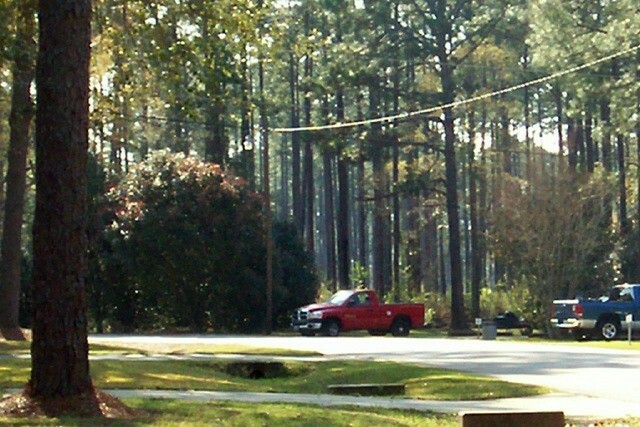 The RV park and layout are almost identical to Ft. Pickett's RV park. (probably not many of you have been there either.) 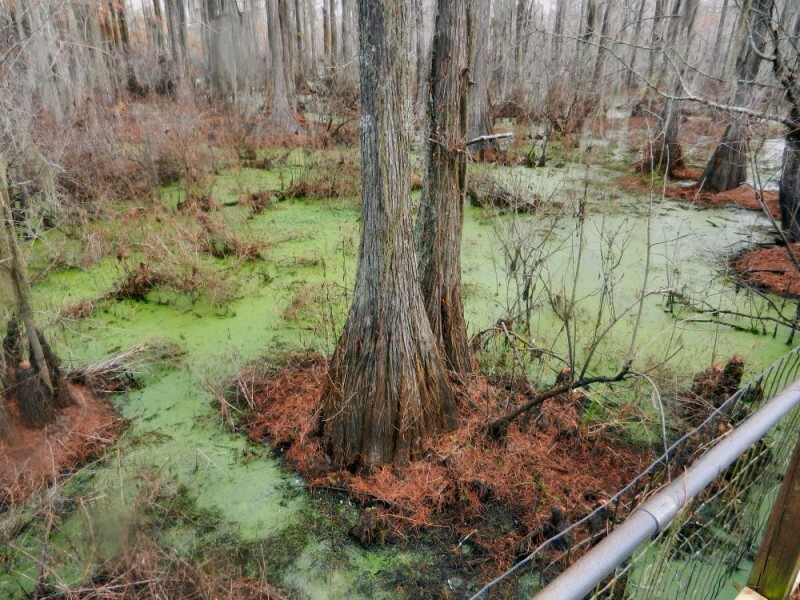 Beautiful treed sites and QUIET. it's close to MCLB housing area, but you'd never know it. PCS civilians - Larry & Bonnie met us on arrival. They said 1 other civilian had lived there 2 yrs. Larry showed us the "unadvertised" cable TV hook up at our site. Only 4 sites total were occupied. No bath-house/showers. Larry said it was "in the planing stages". Nice little base. It's probably too close to Jacksonville, Mayport, & King's Bay to get much business, but it should. Looks like a nice place to spend the winter. No diesel on base. Website directions were good. T.M. left this review using the Directory sofware: It was very quiet, except for the mocking bird!